Prairie Breeze: Hot off the Presses! Our latest edition of the Prairie Breeze newsletter is out now in digital format. Click here or the banner below to download the PDF. As always, you can find previous Prairie Breeze issues in our archive on this website. Prairie Breeze Vol. 290 is Here! Amazing Crustaceans . . . on the Prairie?! Recently, prairie volunteer Greg Jerzyk captured a rare sight with his camera on the prairie–a tower crayfish! 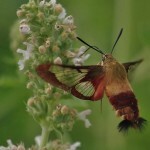 Many people don’t know that a prairie contains such creatures. It speaks to the incredible complexity of this now extremely rare and endangered ecosystem. Below is a first time digital reprint of STPS Director Rita McCabe’s article about prairie crayfish. We hope you enjoy! Few people who study prairies ever claim to be prairie experts. Years of observation have taught them that the prairie’s complexity is slowly revealed over extended periods of time by close, recorded observations of its flora and fauna as well as through studies of their complex interconnectedness. A good example of this interconnectedness can readily be seen by a close look at Procambarus gracilis, a seldom seen prairie denizen, who nevertheless benefits his habitat. Since crayfish must keep their gills hydrated, they are usually associated with streams, rivers, and lakes. While it is true that Wolf Road Prairie has wetlands, it is also true that in many years the wetlands shrink or dry by midsummer. Yet our crayfish persist year after year. So how do they avoid dehydration? The answer lies deep below the surface past the water table. Using their pincher-like claws, Procambarus gracilis tunnel down past the groundwater table creating safe burrows or chambers that satisfy their need for water. 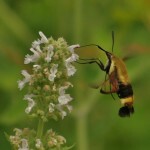 The extensive observations and analysis of two University of Illinois at Chicago researchers, Dennis Nyberg and Paul Orlando (2005) have produced significant information about their habits, and effects on prairies – important data for the preservation of remaining populations. As with all long established habitats, the interplay of flora and fauna add to the stability of the ecosystem, and Nyberg and Orlando were able to illustrate a specific benefit the crayfish provide. The digging abilities of prairie crayfish enable them to excavate deeper than ants, worms, and voles, and in doing so bring up to the surface clay soil from depths as far down as 6 feet. Nyberg and Orlando’s analysis of the clay mounds or crowns that often surround their burrows registered soil rich with minerals. These minerals had overtime leached from topsoil as it was percolated downward by the force of heavy rains. Thanks to their study, we now know that by excavating a new home, crayfish return some of these leached minerals to the surface. These small rusty brown prairie crayfish were once numerous in the Chicago area. A vivid picture of their abundance was described by one Milton Hans in an interview documented by the Northbrook Historical Society in 1956. In recalling what it was like to grow-up in the early 1900’s, Hans described how as a barefoot boy driving the family cows to pasture, he observed: “After heavy rains, the ground especially the road, would almost be covered with crayfish.” He could not recall what happened to this natural bounty, but only remembered that at sometime he did not see them anymore. We now know that many of the prairie crayfish populations were destroyed by the draining of wetlands and the destruction of prairies. Fortunately, pockets of prairie crayfish still persist in many preserved prairies including Wolf Road Prairie and in suitable undeveloped pockets of land. Crayfish add to the diet of wading birds, raccoons, snakes, and turtles. Their own diet consists of snails, insects, plants, and scavenged carrion. Growing to a length of 2”to 3”, these crayfish live an average of 3 to 4 years. Each burrow is occupied by a single adult who will spend most of its time there. When they do venture forth, it is usually at night or after a heavy rain. More recently ( 6/27/14), volunteer Greg Jerzyk, spotted a prairie crayfish aka tower crayfish while working on the prairie. 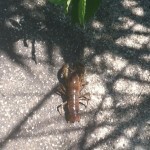 He was quick enough to capture the adjacent picture as the crayfish crossed a prairie sidewalk. If you are out and about on the prairie and observe a grayish-white crown of clay around a small hole, then you have discovered the entrance to a crafyfish chamber. Better yet come after a heavy rain, and you like Milton Hans in the early 1900’s and John and Greg in the early 2000’s, might encounter the excavator. 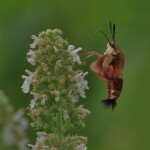 Our resident photographer Fidencio Marbella has captured yet another amazing sight on Wolf Road Prairie in his beautiful action shots of two different species of moths. 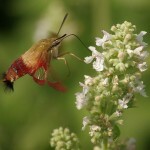 First up is the Hummingbird Clearwing Moth (Hemaris thysbe), named so for its common mistaken identification as a hummingbird. 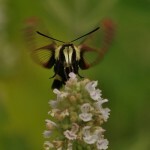 Next up are Snowberry Clearwing Moths (Hemaris diffinis), with their gold color and black band. 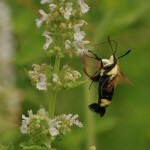 It is always wonderful to see the incredible kind of life inhabiting Wolf Road Prairie. 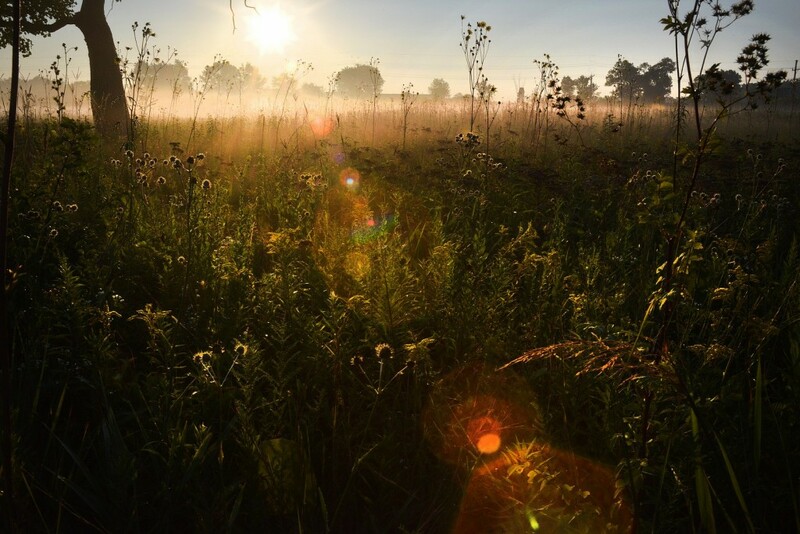 Luckily, avid photographers like Fidencio capture these glimpses into the rare prairie ecosystem for everyone to see! STPS Director Dr. EJ Neafsey has captured a visitor to our historic Prairie House! This barn swallow has nested right above the doorway to the 1850’s schoolhouse and Dr. Neafsey even captured them feeding their young. It is a great example of the life you can see on the prairie–an island of nature in the Chicagoland area! Check it out! Dr. EJ Nefsay, director of Save the Prairie Society, compiled a series of aerial images documenting the changes in the natural landscape of Wolf Road Prairie from 1938 to 2013. Check out this amazing video! Learn About Wolf Road Prairie on Earth Day Weekend! The following is an article written by STPS Director Mary Cray. It has been used for many years as a handout at STPS events but now is online! Please take a look on this Earth day weekend to learn more about the ecosystem STPS has helped conserve for nearly 40 years. “I have amazing news for you. Man is not alone on this planet. He is part of a community, upon which he depends absolutely. The prairies that exist today on our continent are as endangered as rainforests on other continents, perhaps more so. The Wolf Road Prairie was affected by the same geological history as all North American prairies. Contained here is the most fertile soil on earth. Its black soil was maintained by the decomposition of the deep roots and extensions of its plant life. This could not have been done without the vigorous mixing of earthworms, rodents, and insects. It has adjusted to cold winters, hot summers, periods of ample rainfall, and cyclic droughts. When visitors enter this area from the south, they encounter a unique savanna ecosystem. Very soon on the path they will encounter a pre-settler burr oak among many other burr oaks of this savanna. This area has its own unique plant life. Its openness contrasts to the closed forest across the street. It is more that just an access to the wonderful mesic prairie down the path. The contrast belies a past struggle to keep its identity as evidenced by its crusty bark and thick taproots, survival adaptions to its neighboring prairie ?res. Nevertheless, it does present a dramatic entrance to the tall grass prairie. Standing on the edge of these two ecosystems, one is struck by the differences in temperature, wind, smells and sights. Each of over 300 species of native plants has its own blooming cycle attracting many species of birds, butter?ies and insects, some of which can be found only on the prairie. As you travel further down the path, your senses are treated with even more diversity. The wetlands are host to numerous plant and animal species. Among the cattails and sedges are found cover and sustenance for raccoon, deer, red fox, migrating and seasonal birds. This fresh water marsh was formed by an iceberg left by a glacier. The marsh is a complex ecosystem. It serves a myriad of functions: ?ood storage and conveyance; groundwater recharge; erosion reduction and sediment control; pollution control; wildlife habitat; recreation and education. When walking through this prairie one is struck with a sense of history, both geological and historical. There is nothing more American that the prairie. All cultures who have lived in this area, whether Native American or settler, were profoundly affected by this prairie. We, the visitors of the 21st century, seeking to keep this land secure, are grateful to be a part of that vision that unites all that went before. 2013 Digital Annual Report Out Now! If you missed the printed copy of our 2013 Annual Report, check it out here! Inside, you will find stories and articles about all the events and accomplishments of STPS’ in 2013. Check out great photos too! Click on the picture below to view the report (PDF) or find it in our digital publications category on this website. Prairie Breeze Jan./Feb. 2014 Out Now! Check out the latest edition of our Prairie Breeze newsletter! Inside you can learn about upcoming events, prairie ecology and wildlife, STPS news, and more! 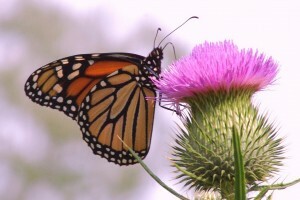 As many of you know, the number of monarch butterflies has been falling in recent years. Each year in late summer and fall, the monarchs of North America east of the Rocky Mountains fly hundreds or thousands of miles to central Mexico’s Oyamel fir forest, where they spend the winter. 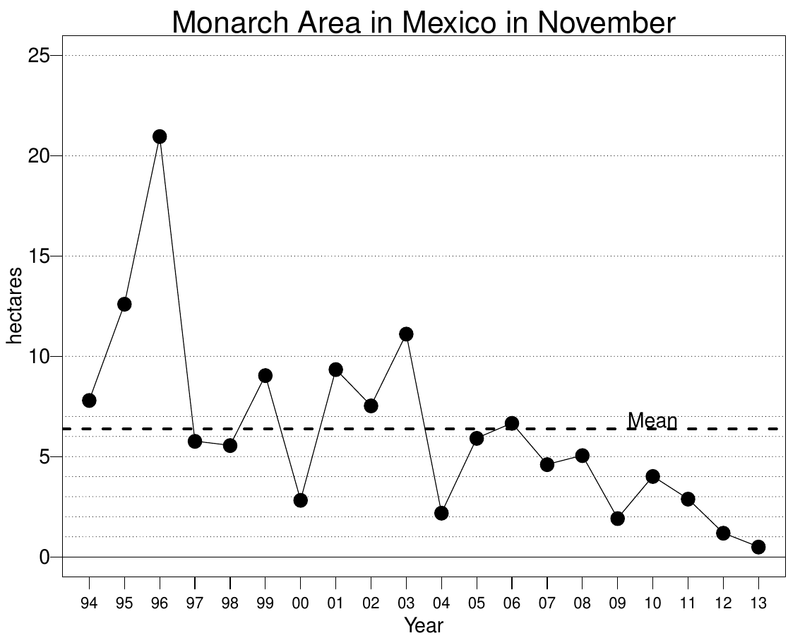 For the last twenty years the area occupied by the monarchs in Mexico has been measured to give some indication of how many made it. As seen in the graph, this area has been dropping steadily for the last six years, and 2013 saw the area fall to its lowest level ever, only 0.5 hectares (1.2 acres, about 3x the size of the Prairie House and its parking lot), and far below the mean level of about 6.6 hectares (16.5 acres). According to scientific studies, the main cause of this decline is loss of habitat, especially the milkweed plants where monarchs lay their eggs and which the monarch caterpillar larvae feed on exclusively. 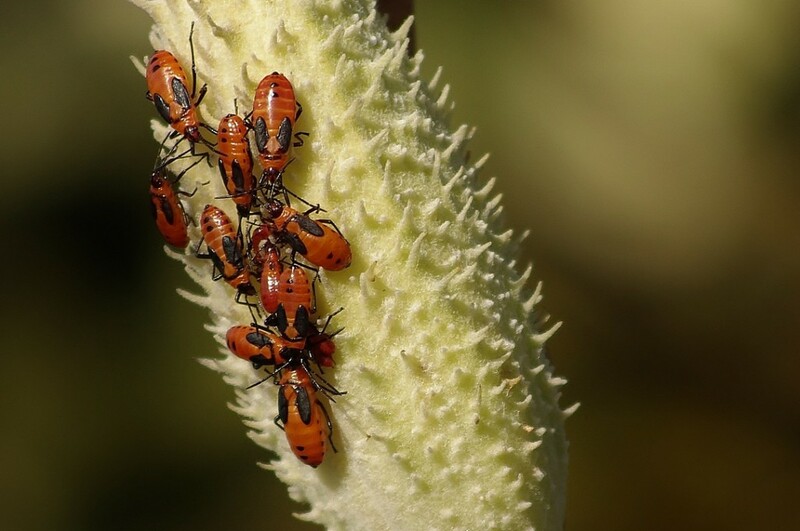 Changes in agriculture are thought to underlie the loss of milkweeds, including loss of traditional hedgerows of native vegetation around fields because the fields are planted and plowed right to the edge. Furthermore, the planting of genetically-modified corn and soybeans, which are “engineered” to be resistant to the herbicide Roundup, means that Roundup can be used to literally kill everything but the corn and soybeans. The number of milkweed has fallen dramatically, and the monarchs with them. Someh ow monarch habitat (milkweed) has to be protected. Individually we can plant milkweeds in our gardens (see Douglas Tallamy’s Bringing Nature Home), and it grows wild in places like Wolf Road Prairie, but the fundamental problem is at the system level of what has become “standard” agricultural practice. That must change if the monarchs we all know and and love are to survive in North America.